Surprisingly simple and with just 4 ingredients, this homemade keto white chocolate is one dreamy fat bomb treat! Think just 2g net carbs per chocolate bar (yup, the entire bar!!). When I say ‘from scratch’ I mean starting with the basic ingredients that make up white chocolate: cocoa butter, a sweetener and a milk powder. But, as you probably know, making chocolate of any form isn’t as simple as melting the ingredients together. After all, there’s a reason why chocolatiers are a dedicated branch in the culinary world. 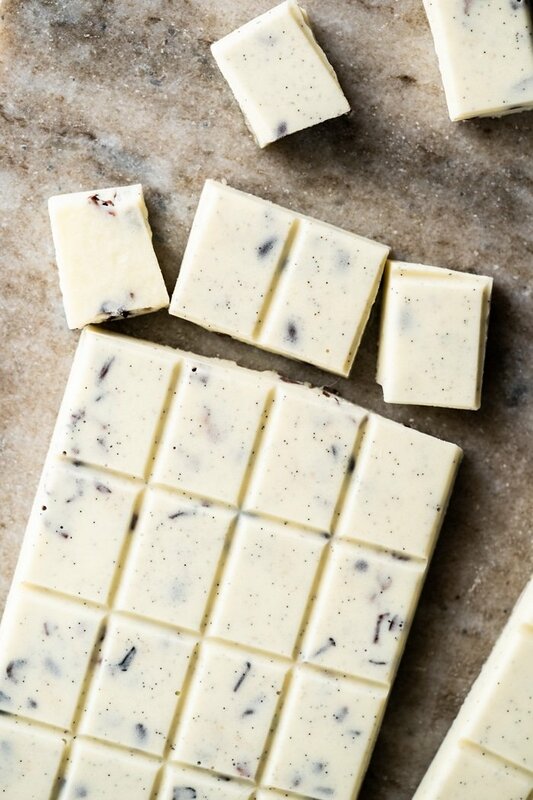 It takes a lifetime to master this beautiful ingredient… and after too many clumped up keto white chocolate messes, I truly get why! But I learned some interesting things in the process, each one yielding a slightly different result in the process. 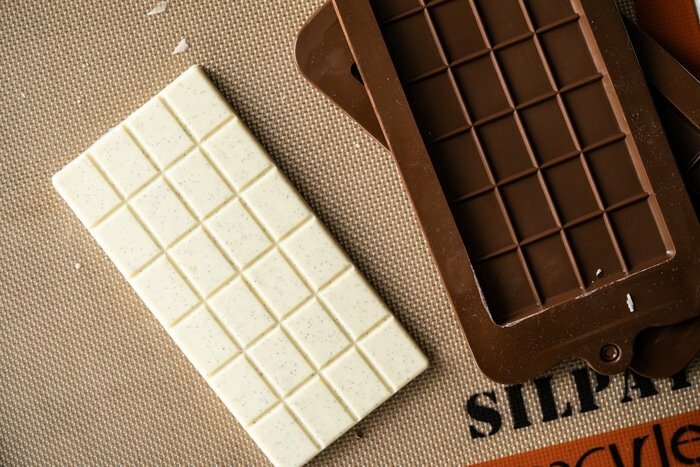 So think of this as a ‘white chocolate hack’, in that you shouldn’t expect a proper tempered chocolate (which does require some professional equipment)… but there’s no grainy-ness here and it really does taste like white chocolate! Just note that it’s not as smooth as store-bought chocolate (which requires roughly 18 hours of mixing!). So I’m fairly certain you’ll be amazed at how good it is (and how clean the ingredients are!). You can even skip the stabilizer if you aren’t planning on using it for baking etc, so it’s essentially an ultra special fat bomb treat. My favorite way to enjoy it? With chopped up toasted macadamias or cacao nibs (think a lazy cookies ‘n cream version!). 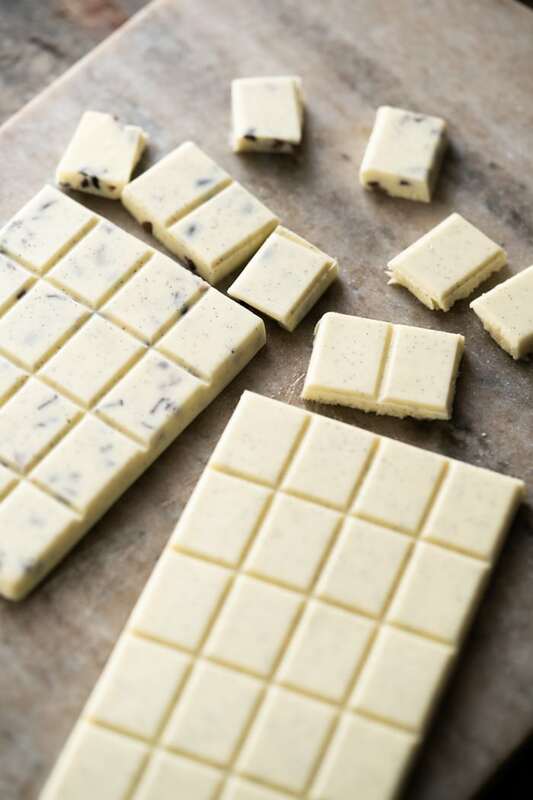 See section below for more tips for a cookies ‘n cream bar (a definite favorite here!). Cocoa Butter. You’ll want to be sure to get a food grade one, and I cannot recommend this organic one from Terrasoul enough (not sponsored). Any of their chocolate-type products is top notch really, but their cacao butter is seriously the best (so aromatic!!). And aside from giving it killer taste, cocoa butter is rich in healthy fats and anti-inflammatory components. Perhaps most famous for being rich in polyphenols, which studies have shown to help skin conditions (think aging and dermatitis), both internally and externally. So feel free to slather your cocoa butter on your skin too! The Milk Powder. Perhaps unsurprisingly, but white chocolate has got plenty of milk powder in it. I did a bit of testing here and found that you can also use heavy cream powder instead. It obviously lends a different taste (more creamy is the best way I can explain it! ), but it does have a lot less carbs. If you use milk powder rather than heavy cream powder it will be 11g net carbs for 1 bar rather than 2g net for the entire bar. So more in line with what you see in standard keto chocolate of 2g net per 4 squares. The Sweetener. Allulose (allulose and more allulose!). OK hear me out guys, xylitol seems to never be able to get back to solid (i.e. chocolate stays a liquid paste…!) and erythritol… well it works, but not really? It has a tendency to separate, get grainy (albeit the stabilizer helps here), but most importantly it just tastes minty. And tbh, I don’t think it’s worth it because it just doesn’t taste too great. So allulose guys! No aftertaste, no gastric discomfort and also zero GI (in fact, its a natural sugar not even a sugar alcohol!). The Coconut Oil. OK, so def not an ingredient of regular white chocolate… but the thing is that I found that without a refiner/melanger (i.e. a professional chocolate mixing machine), the white chocolate turns pasty after you add the milk/cream powder. So a touch of coconut oil helps to keep a nice and smooth consistency. It does leave a slight aftertaste, but you can also try a neutral coconut oil (just note it’s more refined). The Stabilizer (optional), otherwise known as soy lecithin. You’ve probably noticed, but this is an ingredient in all your chocolate (Lily’s included!). Funny enough, it’s actually optional unless you actually want to temper the chocolate and do some baking with it. I mean texture is a bit smoother, but tbh might not be worth the expense. The Vanilla Beans (optional). 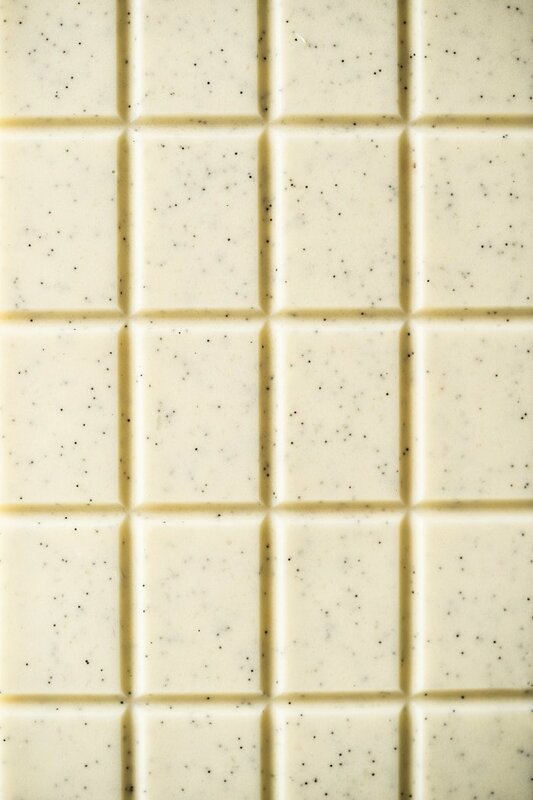 I do love adding vanilla beans to white chocolate as it does make it all the better in my opinion… but totally optional! And be sure to note that I’m talking about the actual beans from a pod, as vanilla extract has water and alcohol that would immediately seize up your chocolate (so avoid at all costs!!!). Not an ingredient, but you’ll also want to procure some sort of silicon molds for a top finish. I used these rectangular ones so they would resemble actual chocolate bars, but any fat bomb molds will work the charm. Or even cupcake liners if you ain’t too fussy about the looks! The most important thing with chocolate, whether your making it or simply melting it, is to keep everything completely dry. And if you’ve ever had your chocolate seize up you know why! This means avoiding wooden spoons (as they tend to hold on to moisture), steam and water droplets. Also be careful when removing the bowl from the double boiler, as I accidentally got some water into my beautiful chocolate when pouring it into the molds once (from the condensation in the bottom of the bowl… meh!). You can either take the lazy route and through in some cacao nibs in (honestly love this so much!) or actually go make some actual cookies (think either our keto oreos or chocolate shortbread). But back to the cacao nibs! They’re essentially the unrefined cacao beans and so packed with a whole load of nutrition (think magnesium, potassium, antioxidants, etc). 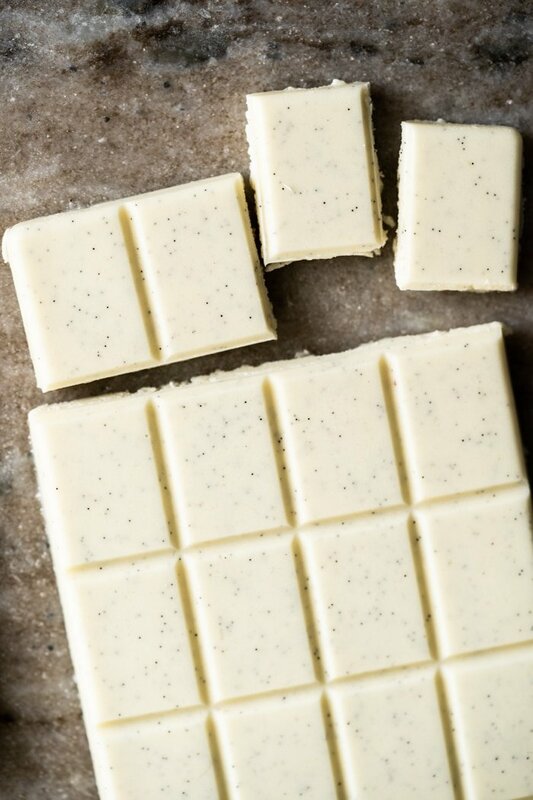 Given that they’re unrefined expect some bitterness, but when mixed with something nice and sweet such as this keto white chocolate they just add beautiful texture and depth. Oh! And be sure to procure a Criollo variety (the best kind there is!). Make sure you have all your ingredients measured out and ready to go. And note that powdered and sieved allulose incorporates better (just run it in a super dry bullet or blender!). Set up a double boiler with a bowl on top (metal bowls work great here), ensuring the water isn't touching the bottom (you want indirect heat here). Also ensure no water or steam will reach your chocolate mixture and keep the heat low. Add your cocoa butter to the double boiler bowl and whisk until melted. If you have a thermometer it should read roughly 120F. Whisk in the soy lecithin (optional), vanilla beans (optional), salt and the allulose a tablespoon at a time. Once everything is smooth, add in the heavy cream or cream powder a tablespoon at a time, whisking very thoroughly to ensure a smooth texture. The mixture will now begin to turn into a paste so add in one tablespoon of coconut oil (14g) and whisk until smooth, only adding more coconut oil if needed until the mixture smooths out once again. If for any reason you notice your mixture is grainy, simply run it in a bullet or blender until smooth (usually the result of adding the milk powder too fast). Pour into your silicon molds, allow to come to room temperature (about 15 minutes) and place in the fridge until set. Note: If adding a 'cookies 'n cream' variant, sprinkle the cocoa nibs or cookie bits throughout the molds and pour the white chocolate mixture on top. *Please see the post for in detail deets of all the ingredients, it's important for this recipe guys! 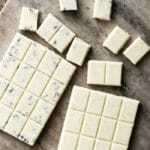 Note that nutrition facts were estimated for the one white chocolate bar (assuming a yield of two! ), that's right an ENTIRE bar is just 2g net carbs!! And also note that if you use milk powder rather than heavy cream powder it will be 11g net carbs for 1 bar (so more in line with what you see in standard keto chocolate of 2g net per 4 squares). I just tried making these. I used powdered monk fruit/erythritol ,no lecithin, powdered coconut milk, and a tiny amount of homemade vanilla. The coconut milk powder made it grainy and it separated while stirring in the vanilla. Can I use HWC liquid next time, or will that cause it to seize? I think I should leave out the vanilla? Hi there!! I’m pretty sure it was the vanilla that seized it (it was liquid right?) xo! Is there any way of making it dairy free?? I love these! Thanks so much for sharing 😍 a quick question – if I use lecithin, can I use it for baking? ie. mix it into a cookie dough? (1) do I need to temper the chocolate? If so, would be just adding a little of cocoa butter to the melted chocolate to seed it? (2) Can I use Ghee instead of coconut oil? Hello Paola! Another great creation 🙂 Do you know if this would work the same with liquid form allulose? I just thought it would mix in better but I am not sure what it would do to texture and setting in the fridge. Any thoughts? Awesome to hear Alline! Tbh I didn’t even know there was a liquid allulose! I’m not sure about the setting, but I would think you’re right and it wouldn’t solidify xo! I’m great at doing traditional sweets, but keto dessert is not my forte. I tried the brownies ans the were like cake and I tried this today. The sugar never melted, is it supposed to? And when I poured it on the mold it looked oily and floury…I used the same ingredients you suggested. Any suggestions?? Did you powder the allulose Carol? That way it ends up smooth. If it separated there’s also the possibility you got some water on it (even a drop or excess steam will do it). Let me know xo! First of all holy crap these are amazing. I made them last night (using your oreos for cookies + cream and some salted almonds for a bark) and the texture and taste is phenom! Secondly, can I keep at room temp or do they need to be refrigerated? Awesome to hear Nicole! 🙂 Honestly they keep better in the fridge because of the coconut oil and since the chocolate isn’t tempered. Having said that, its not like it goes bad at room temp (like with butter fat bombs etc)… just depending on your room temp it might melt a bit xo! 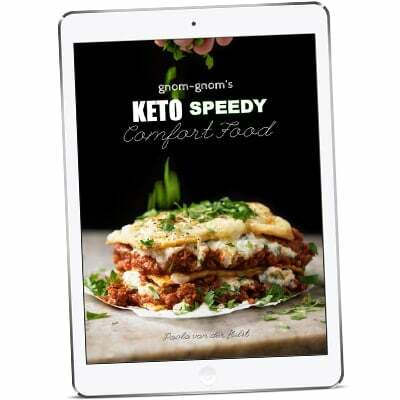 I think this is a great recipe and I love the site, but I’m not seeing how this is only 2g net carbs for the whole bar – the heavy cream powder alone is 5g (looking at the one you link to you use 5 tbsp and each tbsp has 1g sugar). I think you’re looking at another ingredient because it’s 1g not 5g xo! I am being overly whiny. but when I put this recipe in us cups… it still has many ingredients in grams or ounces… I’m not sure how to make that into something I can do?? If I have 8 ozs of cacao butter… divide best I can into 8 parts… ??? I’m SOOO sorry You are disabled with Your sciatic nerve!! OUCH! You are AMAZING BRILLIANT ARTISTIC THOROUGH & UNMATCHED at CREATIVE PERFECTION in healthy eating junk food!!! You have evolved to the Highest level of accomplishment!!! KUDOS!!! Praying You are well soon and back to producing at full speed!! Though You have already produced more than a lifetime’s legacy and You aren’t near done yet I pray!!! Rest well and recuperate!! You can’t pour out of an empty cup Grrrl!! 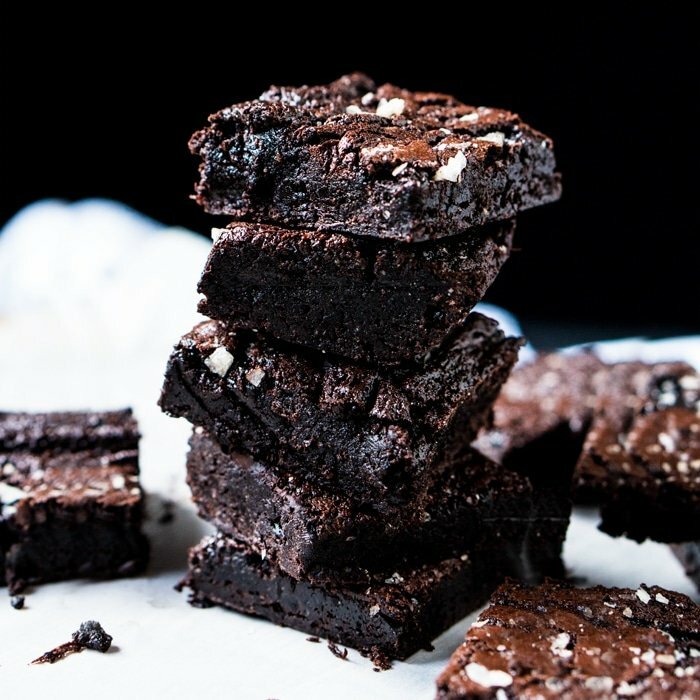 Do you have a dark chocolate bar recipe? Also, I’m dying for a keto orange chocolate tart/torte recipe!!! 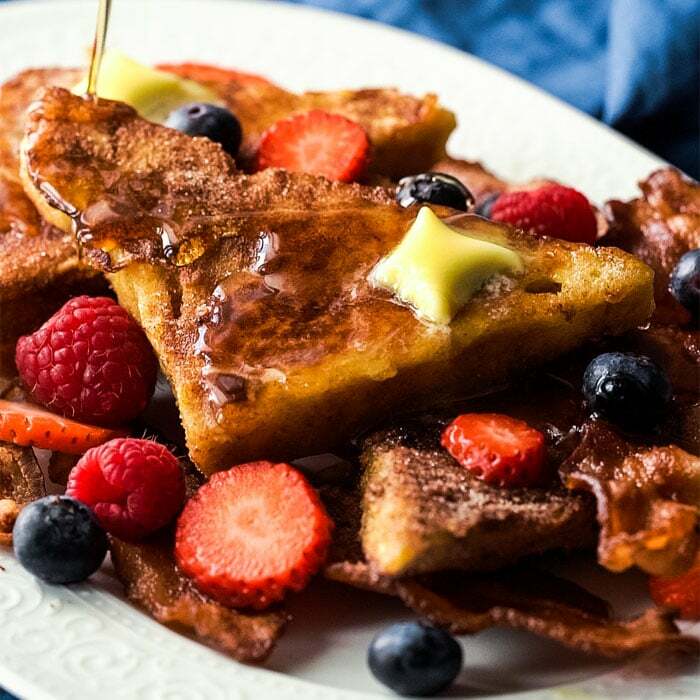 This looks delicious and I’m happy to see all the positive comments! I’ve ordered all the ingredients that I didn’t have and am curious about the optional vanilla beans. The recipe needs only a small bit but the link for the beans takes me to Amazon and a bundle of 10 (pricey!) vanilla beans. If I can find another source for them that doesn’t have so many, do I just grind up part of a bean to make 1/8 teaspoon? Excited to make this, I would love to use white chocolate for baking cookies, cupcakes and frosting so will I need to add in the lecithin for this? Thanks, love your recipes. LOVED IT! I’d made a keto white chocoalte before from another blog with swerve and it was inedible. So I had all the ingredients already so decided to give it a go because… gnom-gnom. Wonderful to hear Carly!! And yup, I’m with you regarding Erythritol sweeteners here… it was all I could taste unfortunately. And yup 2 on the texture, add ins really do a great job at camouflaging the homemade texture 😂! And lastly yes, just melt it gently over a water bath again xo!! Would love to see you come up with a recipe for white chocolate macadamia nut cookies. The problem seems to be that homemade white chocolate will “melt out” in the cookie when baked. Don’t know if there is a way around this without the equipment professionals use. Thanks. Does this have to be stored in the fridge? Sadly, allulose and my body do not get along. 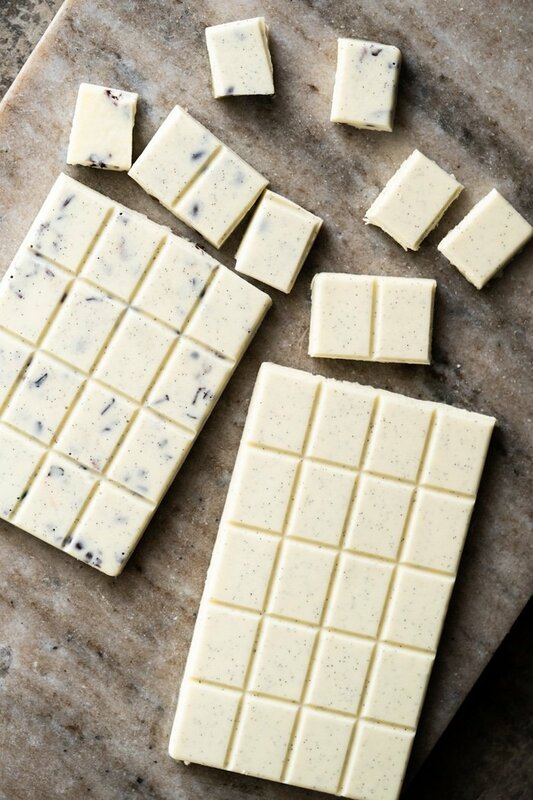 I wish I could use it – I really miss white chocolate. Oh no Jen I’m sorry to hear! May I ask what happens when you ingest allulose? Obviously every single food out there wont be perfect for everyone, but I’m always very interested to hear about reactions to sweeteners). xo! Angie best of luck! Please do report back! Someone asked about this on facebook and I’m super intrigued!!! It works just fine with the coconut cream powder I used 1/2 lakanto 1/2 allulose but will try again with 1/4 lakanto 3/4 allulose next time (allulose is expensive) Word to the wise work very quickly once you add coconut oil stir vigorously then pour in molds immediately and be sure to add 1TBS at a time on the sweetener and powder cream my first batch I must have waited to long it seperated and got all chunky and texture was chewy but the second batch was perfect! I also used sunflower lecithin because I want to use it to bake keto macadamia nut cookies. Thank you for this recipe! Your recipes are always so great! hi! how’s the texture with lakanto? i tried doing a recipe from youtube and used erythritol and it was gritty! For me it turned grainy xo! It works wothcoconut cream powder I found on Amazon. But work quickly and do everything like the recipe states…one tablespoon at a time on the cream and sweeteners. Best of luck! Would love to hear if this went well!! I think someone reported back on the coconut cream powder already guys (said it worked). I haven’t been able to test it out myself yet xo! Ahhhhh!! I’m so happy to see this recipe! I was going to experiment today with making keto white chocolate since it’s so hard to find without artificial sweeteners! I really need to make keto macadamia nut cookies but I NEED white chocolate Gnom Gnom to the rescue! I am thinking I definitely need to add the sunflower lecithin I recently bought…what do you think? Thank you for creating AH-MAZING recipes! I haven’t tried sunflower lecithin tbh, but I do know that the guys from Rebel ice creams use it in their chocolate chips (I read ingredients compulsively lol!) xo! P.S. Just to clarify, I mean vanilla flavoured whey protein concentrate powder! 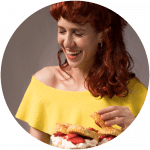 Hello, I love your website and thank gig for sharing so many amazing recipes. OK I’m reading this after! The thing is that the whey protein has had the fat content removed so I honestly don’t think it would taste great? I mean I don’t enjoy whey protein solo (I’m a taster! )… but milk and heavy cream powders are quite pleasant. I hope this helped! Thank you Paola for the fast reply. I’ll see if I can source some heavy cream powder online! It’s my absolute pleasure Sarah! I honestly doubt it? 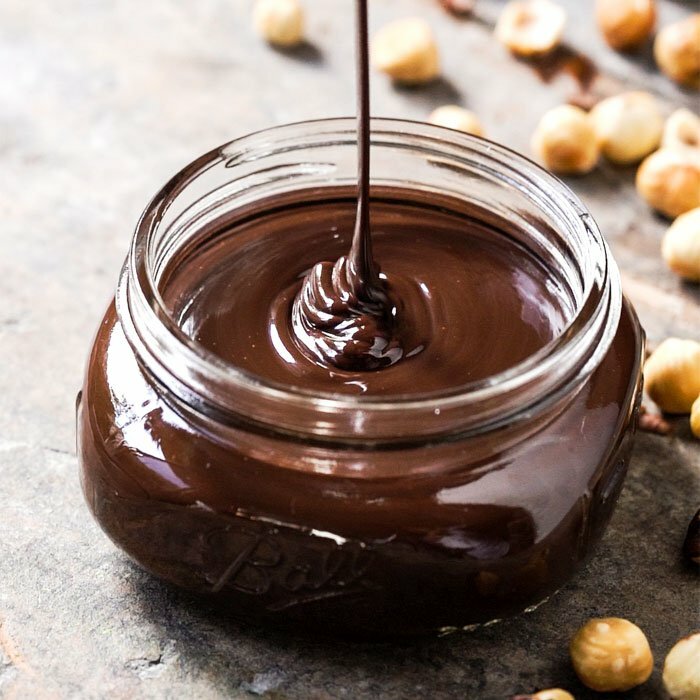 There are likely several ingredients in your protein powder, and chocolate is notoriously difficult to work with (different things change its texture). Allulose is my favorite sweetener so happy to see you’re using it more now! You’re my keto hero Paola!!! Cookies n cream is my favorite candy and it’s so hard to resist! Do you think the oreos or the chocolate shortbread would work better? Lol you’re too sweet Candice! Honestly they’re both super similar recipes. Oreos have an egg so they’re easier to handle… same difference sorta thing?. xo! !